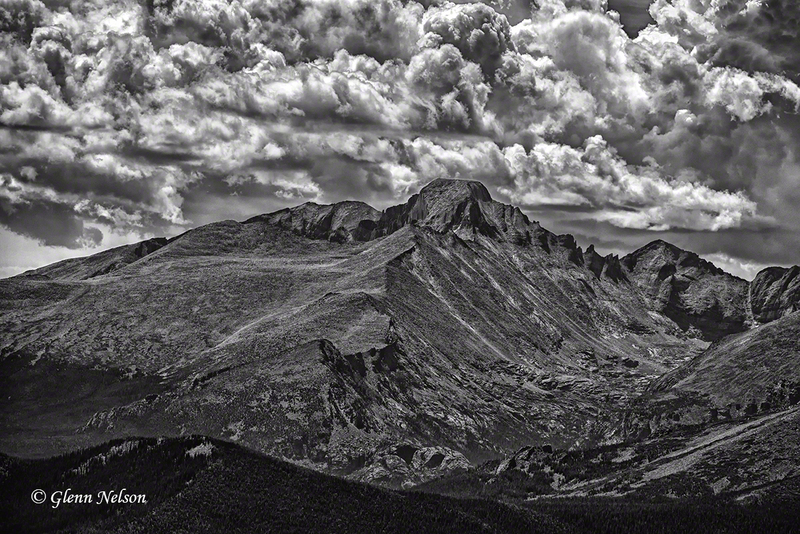 Iconic Long’s Peak from Trail Ridge Road. What I was getting at in my last post is something all serious photographers know, but it always bears repeating: Light is king and, boy, can it be temperamental. To wit, after shooting sunrise (see Rocky Light / Part 1, then spending hours photographing wildlife (see Mile High Mammals), the midday sun had turned harsh, as it usually does. 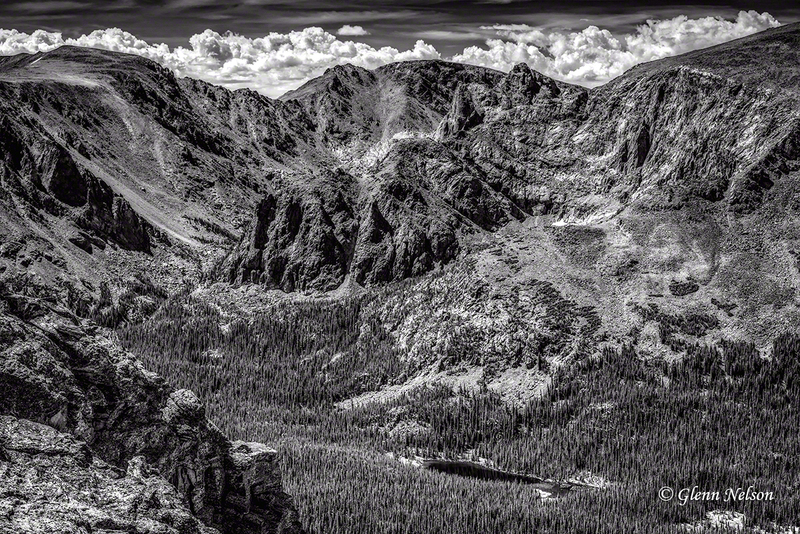 There was time left in our tour of Rocky Mountain National Park for landscapes, but the color was gone and the shadows hard. Still, if you’re out with your camera, and went halfway across the country for the scenery, you aren’t going to just stop shooting. (NOTE: Clicking on a photo will launch a larger version in a separate browser window). L-R: Stones Peak, Sprague Mtn., Hayden Spire, Mt. Terra Toma, Hayden Gorge and Forest Lake. Later in the day, as a prelude to shooting the sunset at Bear Lake, I tried long exposures at Alberta Falls. You’ve got to use non-density filters to get the kind of shot that shows water flow. Some like a quicker shutter speed, but of all the images I captured, I liked the one at 0.8 seconds. With the sun low, and the light filtered by the forest, the scene has a cooler tone to it. 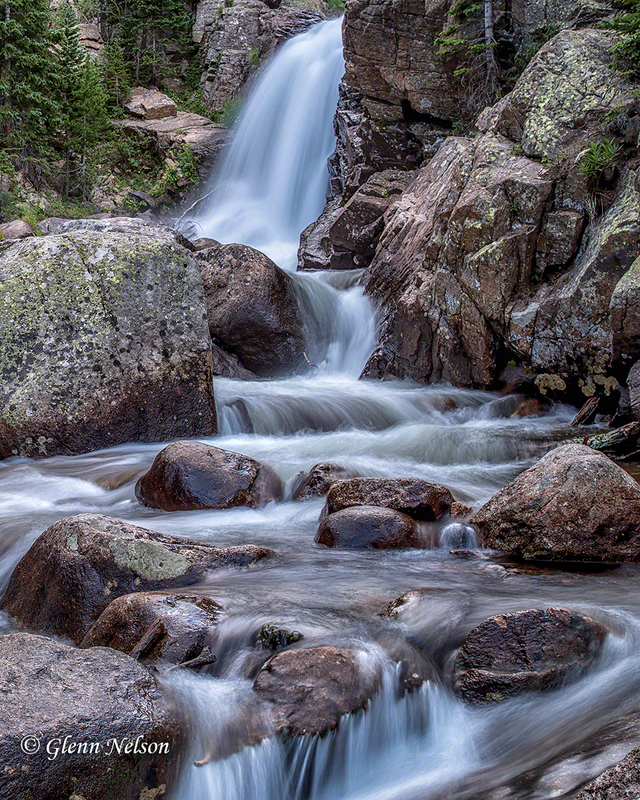 Alberta Falls, on the way to Bear Lake in Rocky Mountain National Park. Though it was mid-morning the next day, the sun already was bright and there wasn’t the same tree cover at the Roaring River falls in the Alluvial Fan. So there’s no cold cast and the colors pop more. Also, I went for a faster shutter speed, though things being relative, 1/15 is not teeth-chattering fast. The outcome is dramatically different, however — much warmer, with the blazing blue sky that helps show off the nice diagonal line of cloud that parallels some of the water flow. 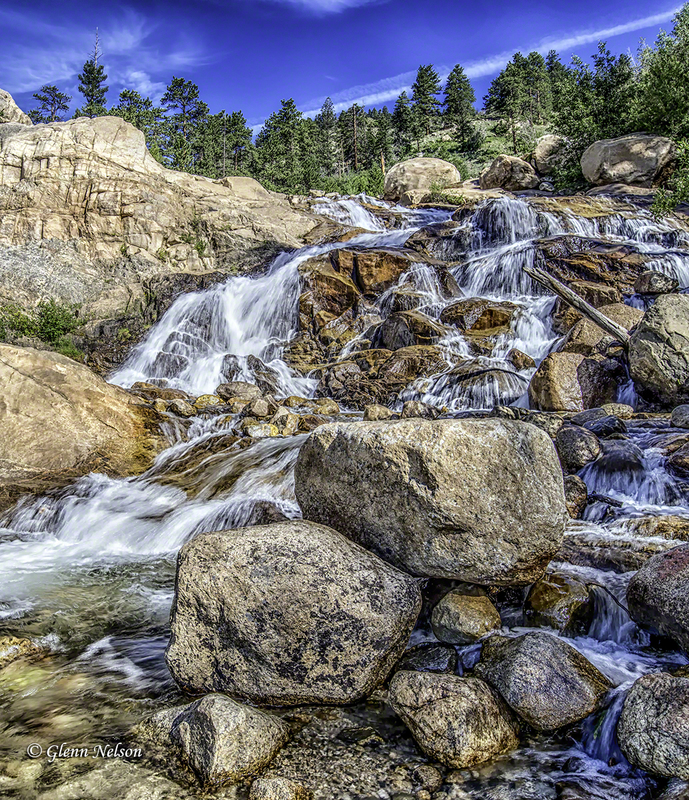 The Roaring River falls at the Alluvial Fan. I think the lesson I continue to learn is that it all takes time. In the macro, it’s time to practice, practice, practice. And in the micro, you need time to prepare for the light, time to adjust, and time to compose. As such, nature photography, whether landscapes or wildlife, often takes up more time than a tour/guide/spouse may afford you (real or imagined). All I know is that my first trip to Rocky Mountain National Park was wondrous, and made even more memorable by the places I allowed my camera to lead me.